The Ouseburn Viaduct between Newcastle and Byker. Opened: 18th June 1839 as part of the Newcastle and North Shields Railway. Designer/Engineer: John and Benjamin Green. Traffic: Rail. Length: 918 ft (280m). Width: 50 ft (15.25m). 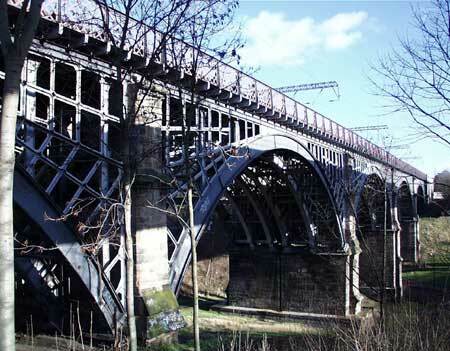 The Ouseburn Viaduct was opened as part of the Newcastle and North Shields Railway 18th June 1839. Designers John and Benjamin Green were responsible for many noteable landmarks in the area, (Greys Monumant, Penshaw Monument and the Newcastle Theatre Royal). The arches were rebuilt in iron 1867-9. Originally two-tracked, the line was four-tracked in 1887 with the addition of a new viaduct alongside and to the north of the original.